Among the many aspects of the sharing economy, perhaps none have the ability to influence the built environment as much as shared space and shared mobility. While shared accommodation and work spaces have allowed for an evolution of typologies that embrace large collaborative areas with smaller shared private areas, we have yet to see the effects of shared mobility on the built form. The shared mobility sector certainly faces significant regulatory risk due to issues of consumer protection, licensing, taxation, and data privacy, among others (Shaheen, Cohen, & Zohdy, 2016), which may have resulted in a time lag due to doubts about the acceptability and overall longevity of the industry. However, given the nimbleness of the various industry actors, assisted in no small part by potential consumers re-thinking ownership based on the lower prices, service reliability, increased choices, and ease of access (PricewaterhouseCoopers, 2015), shared mobility appears here to stay. The shared mobility industry has a current global market valuation upwards of $60 billion and a forecasted growth rate of 20% annually through 2030 (McKinsey Center for Future Mobility), signaling it is time to reimagine the built environment to accommodate this rapidly changing travel behavior. To understand a design response, we must first understand the landscape of the sector. There are generally three options for mobility in the sharing economy. In order of their footprint, they are first- and last-mile connectors, ride-hailing, and on-demand micro-transit. Bike sharing systems are the most common form of first- and last-mile connectivity, although their beginnings were radically different due to a fixed location rental model with staffed stations. After multiple generations of technology infusion aided by GPS technology, mobile payments, and automated docking with real-time availability information, these systems have grown to service 35 million trips in 2017, 25% more than 2016 (National Association of City Transportation Officials). The innovations have continued over the last few years with the sub-sector moving to become dock-less and electric-powered, and adding scooters to the fleet. As a result, shared bikes, and now scooters, flood curbs and street corners thereby further driving up their usage due to their sheer ease of access. Peer-to-peer ride-hailing has been around for decades in the form of carpooling after its origins as a government regulated policy to conserve fuel during WWII (Furuhata, et al., 2013). However, even after adoption by large corporations through the latter half of the 20th century, its pace of adoption was restricted by the limited communication technology that necessitated the service be pre-planned rather than on-demand. However, the proliferation of mobile internet, location-enabled smartphones and social network verification has expanded the sector significantly through the help of matching and coordination platforms like Uber and Lyft. In 2016, just these two companies reached 500 million vehicle miles traveled per month in the U.S., a compound annual growth rate of more than 150 percent (Hensley, Padhi, & Salazar, 2017). With Tesla angling to launch a shared fleet with millions of autonomous cars in the ride-hailing ecosystem in the next five years (Su, 2018), we can expect further disruption in the industry. Micro-transit is a relatively newer concept and is a blend between the fixed routes of public transit and dynamic ride-hailing where shared movement networks are created on-demand, but without the barriers of fixed schedule and routes. Using algorithms, micro-transit platforms helps match participants in real-time and assist in establishing itineraries, pick-up and drop-off locations, prices and payment methods. Since the access and egress modalities of micro-transit function analogously to ride-hailing and public transit, for the purposes of this article’s examination of its effect on the built environment, it is consolidated under the umbrella of ride-hailing. With the travel behavior of shared mobility users differing from that of traditional modes, what aspects of the built environment need to evolve in a mature sharing ecosystem? Whether for first/last mile connectivity or ride-hailing, the curbside boarding and alighting nature of these modes necessitate a re-examining of the interface between the street and the built edge. In dense urban settings, the concentrated rate of transit accumulation would compel an allocation of stoppage space at the curbside, and thereby a possible set-back from the regular built-to-edge perimeter blocks. However, this would need to be a compromise between the on-street accumulation and valuable frontage. A continued cultural shift in mobility patterns may demand new design strategies, whether using different levels for access or block-level accretion areas, though alternatives not adversely affecting operational efficiency would need to be investigated. In suburban locations on the other hand, while curbside access and egress is relatively simple due to the low built density, the built environment would need to improve to provide a safe and comfortable pedestrian environment, at least from the curbside to the building threshold. In addition to suitably reducing walking distances, it would also include aspects of thermal comfort, universal access, traffic calming, lighting, and other related features. Parking requirements should be expected to change as well. While existing norms for most cities in the United States require four equivalent car parking spaces per 1,000 square feet of building area, shared mobility would significantly ease parking requirements. The different modalities of shared mobility would require different responses. Bike and scooter sharing space would need to be provided at every property, but since one car space can accommodate ten bicycles, a higher per capita efficiency can be achieved. The location of parking for first and last mile connectors, however, would need to move curbside to maintain the efficiency of the system. In larger developments with multiple buildings, rather than providing a single consolidated area for parking of first/last mile connectors, they may be separated into smaller portions to service buildings individually to reduce walking distance from the building to the parking, and thereby incentivize their usage. While developers might question requirements for bicycle/scooter parking at their properties, the benefits addressing this issue are mostly in their favor. In addition to driving up footfall of the increasing users of such modes, providing a space creates an opportunity for voluntary user compliance, or if not, a possibility of regulation. Looking at examples in China, private properties are experiencing bikes and scooters being littered everywhere and creating significant operating issues for managers. In addition, advocating for a mode with a higher parking efficiency works in favor of increasing profits by improving spatial efficiency and reducing requirements of land and the costs of developing the parking. With the advent of electrification of the bicycles and scooters, this could even be turned into a cash stream in partnership with companies like Lime and Bird who provide remuneration for charging the units. Shared vehicles typically have a high utilization rate as they are used throughout the day, unlike private vehicles that are parked for 95% of their life (Bondorová & Archer, 2017). Autonomous vehicles would increase usage efficiency even further. While not requiring dedicated parking like private cars, ride-sharing would need short-term holding areas, especially during off-peak hours when demand is low. Rather than be provided at every property, this can very well function as a shared amenity at the block-level in partnership with ride-sharing companies. Reduced parking requirements would increase developable area thereby turning a cost center into a leasable profit generating one. While we cannot expect forecasted parking reduction to have immediate effects on zoning codes, we can master plan for developable spaces, albeit in a later phase, so that a consistent urban form can be achieved. Even if additional development does not occur, the value of the asset could be significantly increased by the provision of green space (Liu & Hite, 2013) both improving its desirability and increasing its pedestrian traffic. The sharing economy, and shared mobility in particular, can no longer be ignored. What started as a trend is now moving towards permanence in the mobility landscape of cities everywhere. It is time developers recognize this changing user behavior and accommodate it in their development projects, thereby improving the user experience, and seizing the opportunity to improve profitability, asset value, and the overall built environment. PricewaterhouseCoopers. (2015). 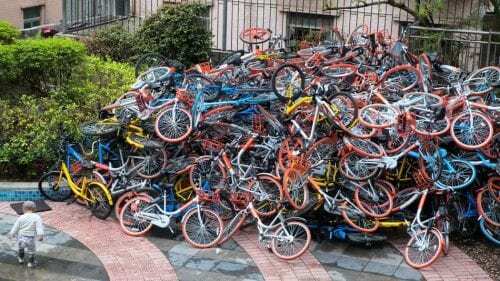 The Sharing Economy. PricewaterhouseCoopers LLP. Bondorová, B., & Archer, G. (2017). Does sharing cars really reduce car use? Transport & Environment. Furuhata, M., Dessouky, M., Ordóñez, F., Brunet, M.-E., Wang, X., & Koenig, S. (2013, November). Ridesharing: The state-of-the-art and future directions. Transportation Research Part B: Methodological, 28-46. doi:https://doi.org/10.1016/j.trb.2013.08.012. Liu, S., & Hite, D. (2013). Measuring the Effect of Green Space on Property. Southern Agricultural Economics Association. Orlando: SAEA. Shaheen, S. S., Cohen, A., & Zohdy, I. (2016). Shared Mobility: Current Practices and Guiding Principles. Washington DC: US Department of Transportation.